Pho Nom is traditional Vietnamese made with the best local produce- it’s the best of both worlds! 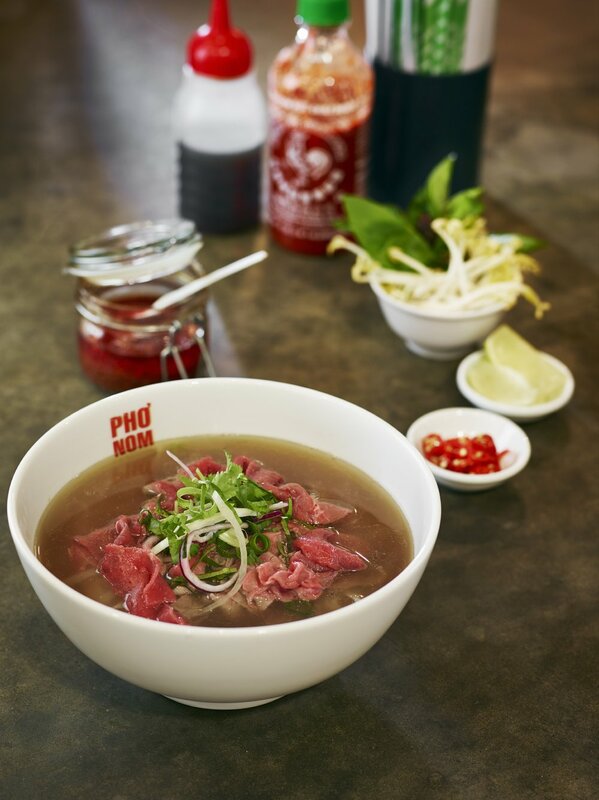 Our famous pho simmers for 24 hours to give it a true depth of flavour but everything else is made fresh daily using authentic recipes. We’re proud of our relationships with suppliers Warialda Beef, Little Creek cattle, Milawa Free Range Poultry and Sher Wagyu and we are excited to be able to bring their produce to your plate. You know the flavours of Vietnam by now – you don’t need us to convince you how delicious this cuisine is. What sets us apart is the care that goes into our food – the respect we give to authentic recipes and the quality of the local produce we use to bring you the best of Vietnamese street food. Our stores reflect the street food vendors of Saigon. Bright colours, communal tables and loud, Vietnamese pop music will transport you to the Streets of Vietnam. Located in the heart of Melbourne's CBD, Collins St is all about fast and fresh during the week. Open 10am until 3pm Monday through Friday, we promise to take you away from your office on your lunch break. We're busy, brash and loud - you just might think you've escaped to a Ha Noi market instead of downtown Melbourne. We might look busy but we will have your order up usually within 5 minutes - even though everything is made to order. This is fast food with a slow food mentality. We love our food and our fashion; Emporium Melbourne brings our loves together in the one place. Once you've shopped til you dropped, come down to the Emporium Melbourne basement and refuel at Pho Nom, the original version of our Vietnamese street food store. You know our fresh ingredients come direct from some of Victoria's best farms specialising in hormone and antibiotic free; free range; grass fed; rare breed and heirloom using sustainable practices, including Warialda Beef, Milawa Free Range Poultry and Otway Pork among others. At Pho Nom, we love to party. Our catering menus are designed to give you a taste of Pho Nom in your home or workplace. Consisting of a selection of our most popular items the catering menus are perfect for working lunches, boardroom meetings, weekend BBQs and get together's when good food is as important as the company and conversation. Email us (info@phonom.com.au) a brief outline of your event requirements and we’ll get in touch to discuss options.